Many things happened.....and i have many things i want to do!! 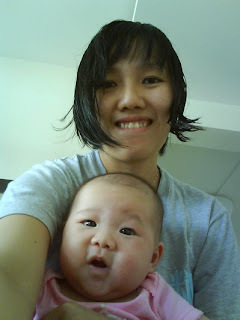 This is my fav..cos she looks so "oooo"
This is the march school holidays..and it was raining almost everyday! so it's one of the rare times you see Eliza in her long sleeve tops (i thought they were be..this is Eliza touching daddy's chin :P so sweet. she's wearing her mittens cos it's time to sleep...i have to mitten-ize her...otherwise she'll scratch herself at night..i really dun know why she is always suddenly 'itchy' during her nighttime sleep. Crawling...we've started putting Eliza on her tummy on places other than her bed, and she has discovered the joy of crawling! 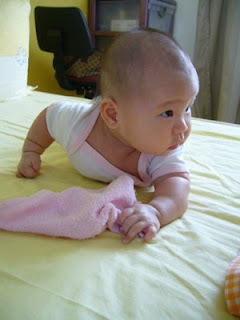 or attempting to crawl...yup..lil soldier. now she's just kicking her legs and not knowing how to use her knees but she still successfully moves...(today she moved 360degrees at the same spot! just turn round and round and round. funny gal. 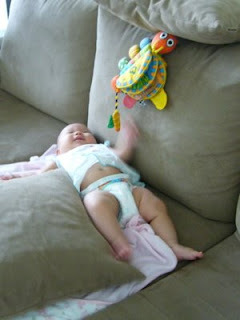 this was on lazy afternoon letting her try out her new found game, moving while on her tummy. 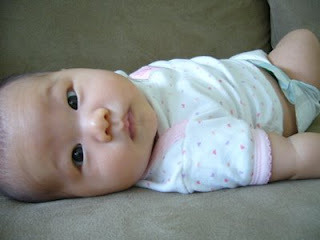 she's relatively happy on her tummy...and this is her..giving her *evil* eye...according to her dad. muscle gal? don't mess with me! daddy talks with Eliza...and Eliza not being really happy...it's not cos she's not happy with daddy, she just doesn't want to be lying down.. The official 4mth old activity...eat chucken drumstick. yeap...she puts anything in her mouth...so although she has tasted her toys, my shirt, my arm, this is quite a new taste!! it's what the elders belief that it'll help baby not to be such a fussy eater. she sure isn't for now! her fav finger stuffing activity...now she has found her thumb though. quite fun watching her enjoy sucking her fingers..but trying not to let her do it too often. I've been reading again. which i realized why...i went back to work this week after a week of break...i'll usually read on my way home in the mrt & bus. i'm always too sleepy to read on my way to work and will doze of (into deep sleep) in the mrt frm tamp to pasir ris and all the way to city hall. i realized i missed Eliza so much on monday. 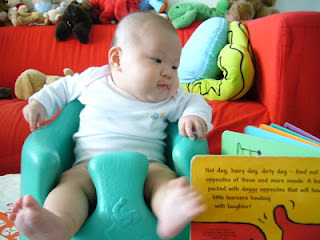 been reading Babywise part 2. talks about weaning & discipline. i'm still a lil unsure how i'll go about starting it. but i won't start her on solids till she's at least 5mths +. can't find the GF book on weaning tho. 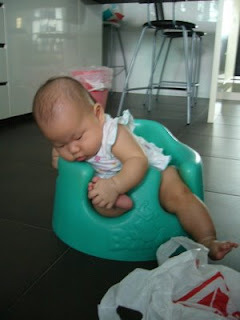 i realized that after dealing with all the milk drinking, sleep and nap issues. once she starts to grow up it's to deal with discipline issues. reading Babywise part2 made me realize that some things need to start early, or more like at the right time and not too late, to prevent having to do re-parenting or correction. a lil elaborate to explain now...cos i got 15 more mins to finished this post b4 i need to feed Eliza her dreamfeed. i wonder if i'll even remember when the time comes...and after all we can say all of us were brought up by our parents in their way and we ended up ok. i would think that good parenting habits will make life easier for parents and their kids. it's a daunting issue...and i also have to communicate it to my mil as well. it's really a process we're gonna be learning (everything feels so experimental!! 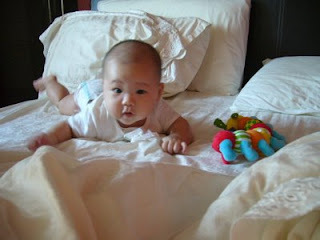 ), and in my bedtime prayer with Eliza, i always pray that God give me the wisdom to teach Eliza to walk in His ways. God help us. 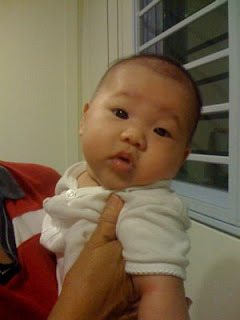 busy weekend with Ww's nephews here and both of them are sick...hope Eliza stays strong!! 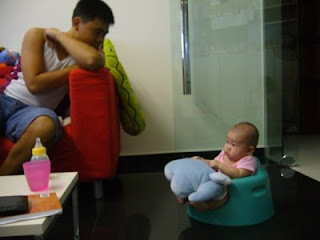 while i'm hanging the clothes...i didn't want to keep her on the sofa out of my sight, so sat her on Bumbo to watch me...but after a while she was more interested in her foot. on of Eliza's fav toy...this elephant called mumbojumbo that we bought from Bangkok last time..it has this bell inside that makes lingling sounds..so i guess that's why..
• Eating dinner like you're trying to break a Guinness world record for the most pasta swallowed in the shortest amount of time. Standing up. 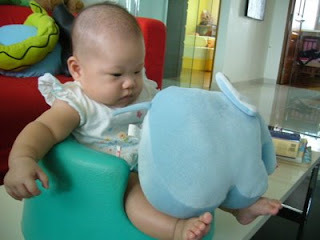 • Figuring out how to pee without putting the baby down. • Spending three hours getting the baby to sleep and then waking him up two minutes later to make sure he's still breathing. weekend is here!...what shall Eliza & I do? 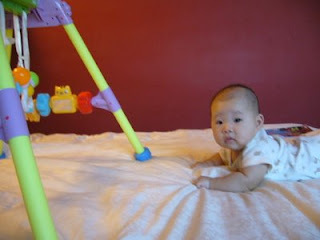 Taken early in the morning last week when Eliza decided to wake at 6am and refused to go to sleep. my mil & Ww helped carry her around while i snoozed in bed. 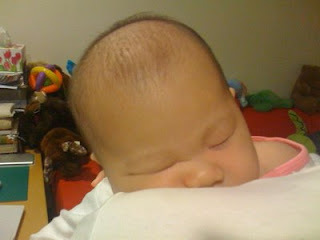 Eliza super sleepy at 730pm...i haven't bathed her yet!! Today at lunch at Taka fair. daddy talking to Eliza. 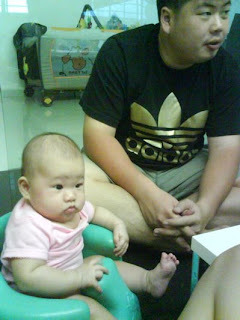 she was quite a good gal watching us eat and playing with her toys..and coating her fingers with her saliva. 1) lifts her head up - easily. 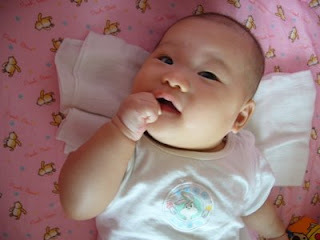 no more anti-colic med to help her burp more easily. few tricks...put her lying down and then pick her up, she burps better aft that..or when she cries when put down, it could be a burp ready to come up. 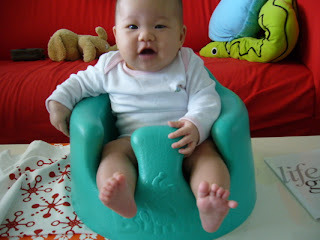 so far she has burped while on her tummy and while sitting on Bumbo. 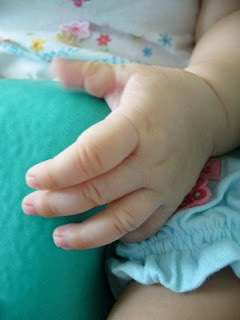 she's learning to grip things better, so her hands will open and close...sometimes tickling us (& esp her daddy) unknowingly. ok..i give up..it's to tedious to keep track...plus everything seems just happen so it isn't so dramatic. anyway off to Taka fair tomorrow..just to check it out...can't deny that the next best stuff to always shop around is baby stuff...now my fav place is Kiddy Palace at CS and Mothercare at TM. so durh. but i can't help it. every kid shop is fun. and clothes are fun to buy as well. it's mad..but i'm trying not to keep buying new clothes....refrain refrain refrain!!! 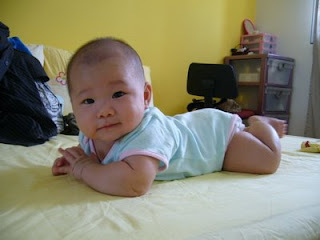 my last purchase was this set of 7 rompers for $40+ (gd buy i think..considering it was mothercare and it's on sale). but it was so irresistible..2 sets were the same pattern, the other had the word gorgeous, chatterbox and i can't remember the last anyway. I love mothercare products! one fine day i'm gonna buy the bedding set...one fine day...when her current bedsheets have holes in them or watever...otherwise she's always looking at the weird looking winnie the pooh. (i searched so hard for pretty cot sheets but it was so hard to find..ikea has pretty blankets but she's too young for those blankets). so what will i buy tomorrow? hardly much anyway...Ww will think it's unnecessary. - oh i'm thinking of a stroller toy to keep her distracted on the go...somehow..or at least when we're having our meals outside. 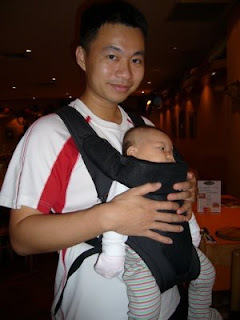 - another baby carrier? 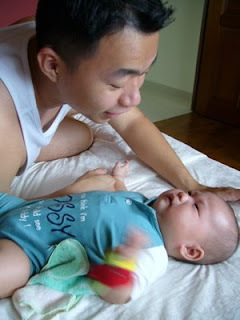 Ww says the combi one is strangling his waist...sigh bought that for $150..bleah..so ex. 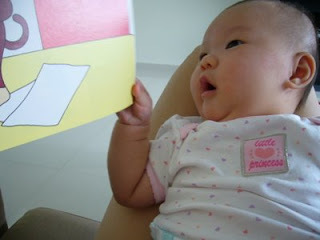 but with the vouchers our friends gave for Eliza's 1st mth. oh the rainy days have allowed us to maximize the use of Eliza's long sleeve clothes...very useful now. but rainy days have caused us to change plans cos it isn't too condusive to go outdoors. wanted to bring her to east coast beach on wed but due to the rains we detoured to airport instead. still it was a nice day out. Whell..not really..just that Ww's parents are off to Genting for a short holiday so i have taken 3 days off work to be home with Eliza. and..i realized i didn't really like being home too much. it's nice to bring Eliza out everyday actually..cos after all the reading, and playing i'm scratching my head on what to do. ok...i leave her to play on her playpen...yesterday i dozed off on the sofa with her staring & playing with the Bug cloth book. 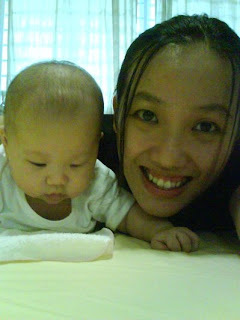 i'm trying tummy time as well...she's fine with it just that i don't do much of it. ventured to church on my own. how? take cab there...and without the pram. why? cos Ww's at BB camp and wasn't home since friday night. Ww's parents left early in the morning at 5am+ for Genting. now...the challenge of going to church on my own is actually the morning prep, and then carrying her thruout the service. the last time Ww had to go Batam early in the morning and i chickened out and stayed home instead. so i made sure i preped all i can prep ahead of time the night before...esp my bag. planned to wake up earlier at 6am to express milk, prep her bathtub, eat bfast etc etc. thank God Eliza slept till 730am (maybe it was the 430am milk) and because i was ready by 7am, i took another 1/2hr nap till 730am. hoho. everything went ok, tho i left the house a lil later than i had planned...i kept scuttering around the house for some last minute thing i forgot. anyway it was a good thing that Eliza was quite in a good mood so she got thru the worship which was loud (i felt) and after that fell asleep for her 9-945am nap (so accurate!) and woke up happy and squealing away (tho not too appropriate to be so noisy then). maybe it was cos i was carrying her all the way. tsktsk..good life babies have. didn't have much time to hang around cos HL offered a ride back (thank you so much! ), cos it was raining. so i got home in time to heat up her milk and play with her. 1. hungry (he was supposed to buy lunch)..ok no..famished! then.....it's going out time! to Vivo! 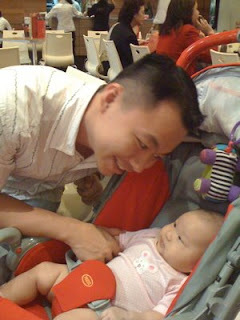 thot we could check out the Taka baby fair but Ww wasn't too keen on trying out Orchard roads (he was driving). so we had a very late lunch at 5pm and walked around, had coffee b4 i insisted that we had to go home (it was 8pm) cos the last time i expressed was at 130pm..i was feeling really uncomfortable and then it will be past Eliza's bedtime..i wonder how she'll take it. now...i thought she'll con't sleeping when i put her in her cot when we reached home but nooo...she woke up and while i managed to coax her back to sleep so i can go express milk, she woke again..but refused to be coaxed to sleep by Ww and cried harder. oh dear..looks like only mummy can put her to bed. (no.2 is my mil). so while she's wide awake...i thot i'll put her beside me but but but while she was staring at the tv..and i was adjusting the toy beside her it accidentally dropped beside her and scared her to tears. poor gal..what a day! so much for sunday...it's a whole week ahead...i'm wondering what to do. tomorrow with Ww on course the whole day i'm cracking my head on what to do...maybe i'll make a trip to TM with her. on wed we're considering a trip down to Botanic gardens or East Coast park..hope the weather will be good! 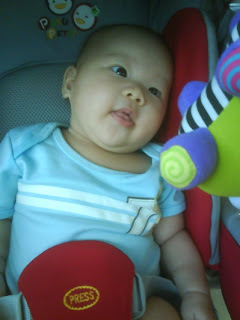 we use her playmat toys at her pram to entertain her...esp when we're having our meals and she isn't sleeping. 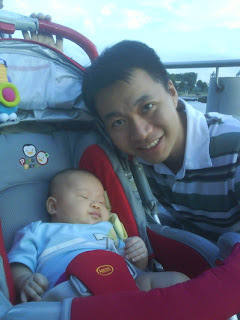 we took a stroll outside at Vivo but she fell snugly asleep instead. I thought i'll rent this instead of buying it considering she'll outgrow it soon. It's not too ex. at those BPs and some sales going on ($56-$59, else it's $70+ - $100+). so i rented it for $10 with $7 delivery charges. it's for a month but we'll see how eventually if i would want to extend it. 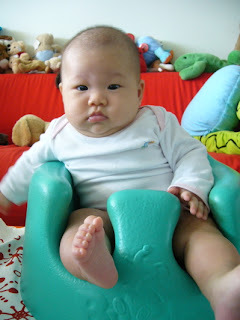 - just letting her practice sitting (instead of lying down or us carrying her all around). 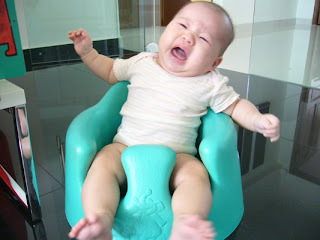 Eliza: I dun wanna sit here any more!!!! this was taken last week...on one of those days i try to get Eliza to sleep but she just wouldn't. so what to do? carry her around? 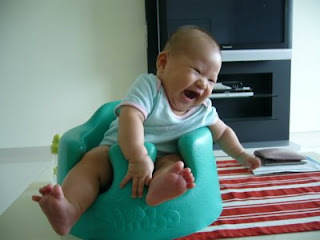 boring after a while..so if she can tahan a seat on my lap...this what she can do on a good mood. It has been a really busy week at work. It has also been a busy night at home. Work..rushing for datelines and helping with a presentation so i came back on friday to help. Amazingly i didn't feel sleepy...ok maybe also kept awake by Meji coffee! Busy night at home cos since last week she has been waking up several times at night..one night it was as often as every hour. i say wake up cos she didn't stay awake...she would kick and 'wave' her arms (cos she managed to get out of her swaddle) and make noises for i dunno what reason..so i'll have to give her the pacifier and swaddle her back. after a while i'm just too zombified to do much. neither was she hungry...tho the past few days i did feed her once or twice. it got better yesterday with her sleeping till 350am since her last feed. 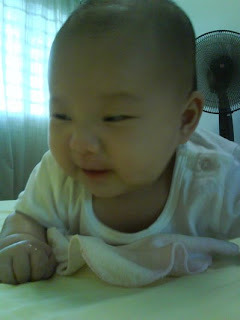 only problem she really wake up at 6am and happily smile at me a gd morning smile. oh dear..i juz want another 1/2hr sleep and she wants to play! funny lil gal. actually it happened yesterday, i saw her sleeping almost diagonally in her cot, worried she might hit her head i shifted her back to her proper position and she wakes up gurgling at me. dear dear. 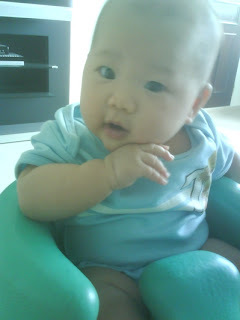 anyway it's a challenging weekend cos Ww's not around and next week Ww's parents will be away at Genting. so i'm home alone...even though it's school holidays, Ww is on course till wed.
there are some stuff i'm gonna have to settle, some house things to be done (fix my dining room lights!) and watever i remember. 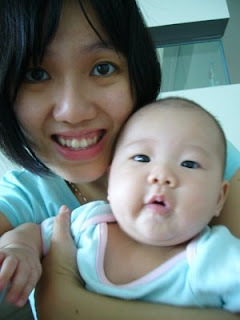 Sunday is also another challenge, going to church on my own...with Eliza. no prams (too logistically inconvenient) so i'll bring the baby carrier instead. 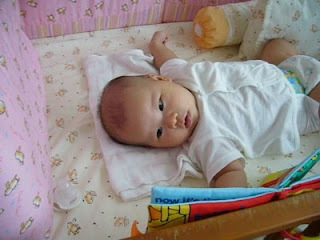 i'm so sleepy now...but in 1/2hr gotta feed Eliza & express milk also so by the time i zz it'll be 12mn. yawns makes me sleepy thinging abt it. i like what Beatrice said in an interview that in an ideal world, there would be 30 hrs in the day, and that she wouldn't need to sleep. gosh if i don't need to sleep it would be nice...but then doesn't it mean that baby also don't need to sleep! so no rest! more when i can update! gotta plan what to do next week! fun! It's been a super busy weekend. (my weekends start from thursday..but it's busy nonetheless). Actually we did a lot of things...cos we brought baby out. out for lunch & dinner on thurs, out to Expo on Friday, out to Parkway & then my mum's place on sunday. so much so we didn't bring her to church on sunday. ok it wasn't really that but cos Ww and I wanted to go out...go for a movie date cos it's my Bday!! also cos all the going out, i think, was overstimulating Eliza and she's been going off her routines, waking up lots of times and night and even wanting milk in the middle of the night (tho this started happening on tues). i'm also confused as to when to put her bedtime bath..b4 milk or after milk? i'm still confused. 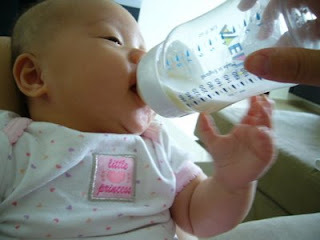 :S we've done b4 and after...and i hope it's not confusing her...it's hard doing 1/2 b4 milk cos she's edgy and my milk says after milk too late liao...cold. anyway so much happened, but i'm tired liao...it's been hard waking up many times at night trying to get Eliza back to sleep cos she kicks her swaddle off, keeps swiping her face, and then needs the pacifier (usually..tho occasionally she falls back to sleep after i swaddle and pat her..but with the pacifier is faster). i dunno why she has to fuss so many times...confusion no.2 . Reading! she loves this particular page of the baby in the garden...my mil likes it too cos it has greener colours which she feels it's better for her eyes. and there's interesting stuff to talk about, like the 5 apples on the tree, the xiao3 ji1 (little chicks), xiao3 mao1 (small cat). Daddy bringing carrying her on the carrier. 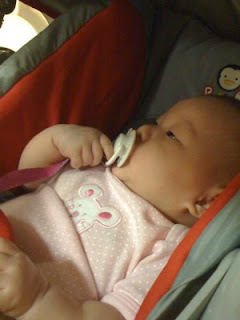 we took the risk of abandoning her bedtime routine and brought her out for dinner with our friends. we wrapped her cos it was night time and a cold day...i realized the long pants that i thot was too long is in the end too tight for her!! left marks on her fat tummy...poor gal. Eliza: Oo? You said something? 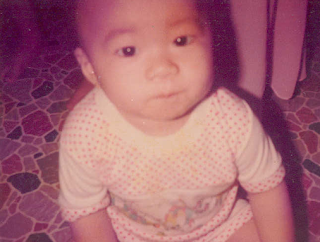 daddy says that this photo looked a lot like a photo of him when he was 1 yr old! Eliza reading again...ok it was more of me reading and she trying to grab the page to turn the book..I love Spot (the dog) books and Ww bought 2 while at Vivo last week after discovering that it's cheaper to buy these in SG than frm Amazon.